A dictionary (according to WIKIPEDIA, the free encyclopedia) is a book or collection of alphabetically listed words in a specific language with definitions, etymologies, pronunciations, and other information. Besides, it could be a book of alphabetically listed words in one language with their equivalents in another. In many languages, words can appear in many different forms, but only the undeclined or unconjugated form appears as the headword in most dictionaries. Even if dictionaries are most commonly published in the form of a book, some newer dictionaries, e.g. StarDict and the New Oxford American Dictionary are dictionary software running on PDAs or computers. There are also many online dictionaries accessible via the Internet. A sub-field dictionary covers a singular field (e.g., constitutional law). For example, the 23-language Inter-Active Terminology for Europe is a multi-field dictionary, the American National Biography is a single-field, and the African American National Biography Project is a sub-field dictionary. A language for specific purposes (LSP) dictionary is a dictionary that is determined to describe a variety of one or more languages used by experts within a particular subject field. At the same time LSP dictionaries are often made for semi-experts and for users who may be beginners regarding a particular subject field. In contrast to LSP dictionaries LGP (language for generic purposes) dictionaries are made to be used by an average user. LSP dictionaries may have one or more functions. For example, they may have communicative functions such as help users to translate texts, help users to understand texts and help users to produce texts. Dictionaries may also have cognitive functions such as help users to develop knowledge in general or about a specific topic, e.g. the birthday of a famous person and the inflectional paradigm of a specific verb. Another variant of a specialized dictionary is the glossary, an alphabetical list of defined terms in a specialised field. The simplest dictionary, a defining dictionary, provides a core glossary of the simplest meanings of the simplest concepts. From these concepts, others can be explicated and defined, in particular for those who are first learning a language. In English, the commercial defining dictionaries typically include only one or two meanings of fewer than 2000 words. With these, the rest of English, and even the 4000 most common English idioms and metaphors, can be derived. Dictionaries for languages for which the pronunciation of words is not apparent from their spelling, such as the English language, usually afford the pronunciation, often using the International Phonetic Alphabet (IPA). For example, the definition for the word dictionary might be followed by the (American English) phonemic spelling: /ˈdɪkʃəˌnɛri/. American dictionaries, however, often use their own pronunciation spelling systems, for example dictionary [dĭkʹshə-nârʹē] while the IPA is more commonly used within the British Commonwealth countries. However others use an ad hoc notation; for example, dictionary may become [DIK-shuh-nair-ee]. Some on-line or electronic dictionaries provide recordings of words being spoken. There are several associated lexicographical terms that we meet when studying languages. Those are a vocabulary, dictionary, thesaurus, lexicon, and glossary. Needless to mention that these terms are often mixed up. That is why I decided to briefly describe them using Wikipedia. Let us start with a vocabulary. A person’s vocabulary is the set of word they are familiar with in a language. A vocabulary usually grows and evolves with age, and serves as a useful and fundamental tool for communication and acquiring knowledge. Reading vocabulary – all the words a person can identify when reading. Listening vocabulary – all the words a person can easily recognize when listening to speech. This vocabulary is enhanced in size by context and tone of voice. Writing vocabulary – all the words a person can employ in writing. The writing vocabulary is stimulated by its user. Speaking vocabulary – all the words a person can use in speech. Free nature of the speaking vocabulary often leads to misuse of words. 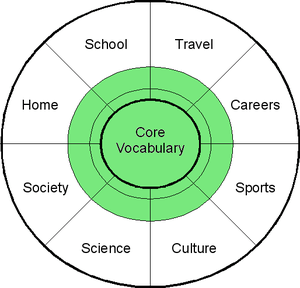 Focal vocabulary – is a specialized set of terms and distinctions that are particularly important to a certain group and reflect experience or activities of this group. In the earlier phase, vocabulary increase needs no effort. Infants hear words and mimic them, finally associating them with objects and actions. This is the listening vocabulary. The speaking vocabulary follows, as a child’s mind becomes more reliant on its ability to express itself without gestures and mere sounds. Once the reading and writing vocabularies are acquired the anomalies and irregularities of the language can be determined. In the first grade, an advantaged student (i.e. a literate student) knows about twice as many words as a disadvantaged student. This leads into a wide range of a vocabulary size in the fifth and sixth grade, when students know about 2,500–5,000 words. These students have learned an average of 3,000 words per year, approximately eight words per day. After leaving school, vocabulary enhances areally. Even if we learn a word, we understand it better when we hear the words in combinations with other words in phrases, where it is commonly used. Native-language vocabulary: Native speakers’ vocabularies vary widely within a language, and are especially dependent on the level of the speaker’s education. In 1995 the vocabulary size of college-educated speakers came to about 17,000 word families, while first-year college students had about 12,000. Foreign-language vocabulary: The vocabulary size influences significantly the language comprehension. The researchers studied texts totalling one million words and found that if one knows the words with the highest frequency, the person will quickly know most of the words in a text. By knowing the 2000 words with the highest frequency, one would know 80% of the words in those texts. These numbers should be encouraging to beginners, especially because the numbers in the table are for word lemmas (i.e. the canonical form of all the forms of the given word with the same meaning), which give even higher coverage. Nevertheless, we need to understand about 95% of a text to be close to full understanding and it looks like one needs to know more than 10,000 words for that. Several word lists have been developed to provide people with a limited vocabulary as an effective means of communication or of gaining quick language proficiency. In 1930, Charles Kay Ogden created Basic English (850 words). Other lists include Simplified English (1000 words) and Special English (1500 words). The General Service List 2000 high frequency words was compiled by Michael West from a 5,000,000 word corpus. It has been used to create adapted reading texts for English language learners. In order to make our debate more vivid and more animated I am appending several items about Web 2.0. Although the term suggests a new version of the World Wide Web, it does not propose any update to any technical specifications. It is rather about changes in the ways software developers and end-users utilize the Web. Nevertheless, Web 2.0 comprises the idea of more widespread application of interconnectivity and interactivity of web-delivered content. 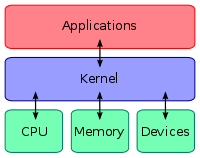 Building applications and services around the unique features of the Internet are considered Web 2.0 main characteristics. 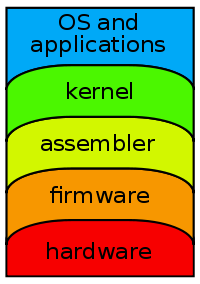 Level-3 applications, exist only on the Internet. Examples are eBay, Craigslist, Wikipedia, del.icio.us, Skype, dodgeball, AdSense. Level-2 applications can operate offline but gain advantages from going online. For example, Flickr benefits from its shared photo-database and from its tag database. Level-1 applications operate offline but gain features online (Google Docs & Spreadsheets, iTunes). Level-0 applications work as well offline as online. Examples are MapQuest, Yahoo! Local, Google Maps, Gmail. According to Best, the characteristics of Web 2.0 are: rich user experience, user participation, dynamic content, metadata, web standards and scalability. Further essential attributes of Web 2.0 include openness, freedom and collective intelligence in the sense of user participation. “Web 2.0” applications are loosely associated with technologies such as wikis, blogs, social-networking, open-source, open-content, file-sharing, peer-production, etc. the ability to create constantly updating content. In wikis, the content is iterative in the sense that people undo and redo each other’s work. In blogs, content is accumulated in posts and comments of blog visitors. classification of content by creating tags that are simple, one-word descriptions to facilitate searching and to avoid rigid, pre-made categories. automation of some of the work and pattern matching. the use of RSS (Really Simple Syndication) technology to inform users about any changes of the content by sending e-mails to them. Nonetheless, the “WEB 2.0” service mark was registered at the United States Patent and Trademark Office (USPTO) on June 27, 2006. The European Union application remains currently[update] pending after its filing on March 23, 2006. ВГ: What foreign languages do you speak or understand? БК: German, with a dictionary. ВГ: Какими иностранными языками Вы владеете? ВГ: What role do foreign languages play in your professional life? БК: Before coming to Germany I did not need foreign languages, they were not of significant importance, had only informative meaning. In Germany I have realized that it could be helpful to understand English because of computers. I use professional German profiting an electronic translator. ВГ: Какое значение имеют в Вашей профессиональной биографии иностранные языки? БК: До приезда в Германию в иностранных языках не нуждался, не имели решающего значения, только информативное. В Германии почувствовал, что было бы неплохо знать английский из-за компьютера. Немецким профессиональным языком пользуюсь с помощью электронного переводчика. ВГ: Do you feel you need to improve your knowledge of the foreign language? БК: Living in Germany I feel it is absolutely necessary. On-line teaching and learning could significantly help, a direct contact with a teaching program, questions, answers, evaluation of answers correction enables you to become aware of your success and failures. ВГ: Чувствуете ли Вы необходимость совершенствовать своe знаниe иностранного языка? БК: Живя в Германии, это крайняя необходимость. Существенно бы помогло онлайн обучение, непосредственный контакт с обучающей программой, вопросы, ответы, оценка правильности ответов, чтобы знать, как продвигаешься вперед. ВГ: If you started to study English now, what kind of texts do you prefer: for example about travelling, culture, holiday, literature etc. or technical texts connected with your profession? БК: Undoubtedly technical texts. I very often meet them. I frequently need them for my activities. ВГ: Если бы Вам пришлось сейчас начать изучать английский язык, какие тексты Вы как профессионал предпочли бы использовать, например, про путешествия, культуру, досуг, литературу и т.п. или технические, связанные с Вашей профессией? БК: Несомненно технические. С ними я чаще всего встречаюсь, они мне нужны для дела. ВГ: Do you think that new information technologies could help in studying foreign languages? БК: No doubt they could. For example computer-aided teaching and learning programs, the best for on-line communication, MP-players, chat-communication. Specialists can surely offer another possibilities, too. ВГ: Считаете ли Вы, что современные информационные технологии могут помочь в изучении иностранных языков? БК: Безусловно могут помочь. Например, программы, использующие для обучения компьютер, лучше всего онлайн, МП3 плейеры, чат-разговоры. Специалисты наверное могут предложить и другие возможности. ВГ: What are the most serious problems you meet or have met using a foreign language for practical purposes? БК: The most necessary and the most difficult matters are business letters, job applications, answering to questions of social bodies etc. When writing these things, you realize your knowledge of grammar is insufficient, your vocabulary is very poor. The vocabulary maybe is the most important. In such situations dictionaries on a computer could help, for example a dictionary of synonyms, one language dictionaries etc. ВГ: С какими наиболее серьезными проблемами Вы встречались и встречаетесь, используя иностранный язык для практических целей? БК: Самое нужное и самое трудное – это деловая переписка, далее заявления о приеме на работу, ответы на вопросы социального ведомства. Не хватает знания грамматики, запаса слов. Запас слов, пожалуй, самое главное. Здесь бы помогли словари на компьютере, например, словарь синонимов, словарь иностранных слов. ВГ: Thank you for answers, for your time. To your success in mastering foreign languages. ВГ: Спасибо за ответы, за Ваше время. Больших успехов в овладении иностранными языками.